Established early 1968, Finchley Boys quickly became a popular live act in and around their birthplace of Champaign, Illinois. The next step, of course, was to transfer the magic onto tape, and in September the band entered the studio with the goal of putting together an album. Sessions continued through June 1969, but the results of the band’s work did not materialize until a few years later, when “Everlasting Tributes” was released. 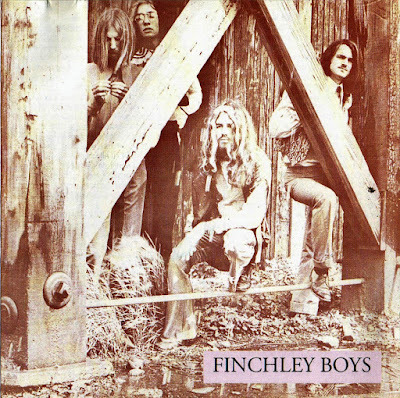 Acid-fried blues rock was where Finchley Boys were at, and their affection and aptitude for the music resonates loud and clear amid the album. Gutted with bone-crushing guitar leads, bristling with venom, “Everlasting Tributes” indicates the band spent a lot of time spinning sides by the Yardbirds, while casting a further ear towards the progressively heavy sounds of bands such as the Litter, Iron Butterfly, and Steppenwolf. Striking a neo-jazz stance, “Once I Was A Boy” emulates both Cream and the Doors, and a shout-out goes to the Kinks via a weighty cover of “I’m Not Like Everybody Else.” But influences aside, Finchley Boys certainly had their own personal ambitions in check. The band’s arrangements could be rather challenging, and their songwriting instincts were commendable. In fact, two of the album’s best tracks, “It All Ends” and “Restrictions” are original numbers. Floating on atmospheric ground, “It All Ends” is wrapped in a lonely psychedelic fog, where “Restrictions” is a hard rocking monster seething with angry vocals, screaming power chords and throttling rhythms. Navigated by military-styled drumming, “Hooked” and “Who’s That Talkin’,” a traditional blues piece peppered with a jagged jam and dirty harmonica huffing and puffing, also receive a solid stamp of approval. With the exception of the emotionally fragile “Swelling Waters,” there’s nothing the least bit poised or pretty about “Everlasting Tributes.” Pockmarked with warts and scars, the album inspects Finchley Boys in their natural state. But it’s the earthy and edgy performances, topped with an organic production, that make “Everlasting Tributes” the intriguing relic that it is.